I've been a quiet fan of Camile Thai for a while now. They are part of the growing amount of proper Thai restaurants which cater to the apparently insatiable Dubliner demand for Thai food. With takeaway locations in Phibsborough, South Circular Rd, Dun Laoghaire and a brand new sit-down restaurant in Rathmines, Camile are giving the public what it wants. Last weekend, we managed to get not one, but two Camile Thai meals. This was not intentional on our part, but resulted as part of a fortuitous chain of events. I was delighted to receive an offer for a preview tasting of a special limited edition dish created by Kevin Thornton. Himself and myself looked at our weekend calendar, and decided to use this offer on Sunday night. However, just a mere day earlier I had responded to Camile Rathmines on Twitter and managed to secure some #cameal Tweetseats for Monday lunchtime. First up was the Kevin Thornton special meal which will be available from Monday, July 16th. The dish is inspired by Kevin's travels in Mae Chan and features chicken marinated in lemongrass, ginger, garlic, chili, spices and citrus zest, cooked in a Thai sauce along with fresh herbs and vegetables. This dish arrived at our home in a paper delivery bag bearing an image of the man himself along with instructions on how to assemble the dish. Essentially it's one carton of noodles and one of chicken and veg, but the instructions only tell you to pour out 3/4. We were left wondering what to do with the other 1/4? Truth be told, that puzzlement didn't last long as we thoroughly enjoyed the dish which was fragrant, light and packed full of crunchy vegetables such as cauliflower and baby corn. I generally choose more heavily flavoured Thai dishes such as chili oil stir fries or curries so I was really surprised by how much I enjoyed this lighter, more subtle dish. As part of the Kevin Thornton meal, we also received one complementary starter of Po Pia Sot (Thai rice paper salmon rolls, normally €5.50) which we supplemented with a portion of Crispy Pork Belly (€5.50). The pork belly, unsurprisingly, is fatty but comes with a sweet chili dipping sauce to balance it out. The salmon rolls are served cold with the contents showing through the translucent rice paper, and make for an interesting alternative to the usual crispy, fried type starters. The very next day we visited the new sit-down restaurant in Rathmines to sample some more Thai food, this time as part of the #cameal promotion. This entitles two people to two main courses and ice-cream for free. Starters and drinks are purchased separately. This type of promotion has proved insanely popular at Crackbird and Skinflint, and is bound to bring lots of new and faithful customers to the Rathmines location. The interior is nicely decorated but orientated towards functional rather than comfort. You decide what you want to order, place your order at the till, gather your cutlery and delph and take a table. The food is delivered to the table in takeaway cartons which you then decant into bowls (if that is what takes your fancy). This type of service is good for quick informal meals, but having a large menu on the walls, or more signage on the process would greatly help. It's early days at the restaurant though, so maybe this will be resolved in due course. 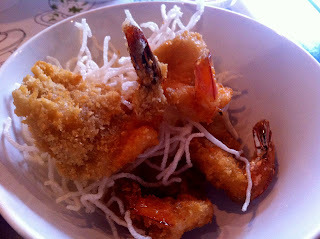 We ordered a shared starter of Thai Butterfly Prawns served with mango sweet chili dipping sauce and more of the ubiquitous crispy rice noodles (€5.50). No need for additional comment, these prawns were exactly as you'd expect. My main of prawn massaman was a rich, gently spicy, creamy curry with nicely cooked cubes of potato and a decent handful of plump prawns (€11.45). I just love the richness of this kind of curry, but it can be ruined in a second by lumps of undercooked potato, thankfully this was not an issue here. Himself had chosen the beef Pad Prik, which is a black bean sauce and chili based stir fry (€10.50). At first taste it seemed a bit bland, but once we stirred up the contents of the carton, it came to life. Both dishes came with good sized portions of steamed rice. Once we had eaten enough adult food, it was time for the inner child to emerge. Two ice-cream cones had been delivered with our food, and himself headed up to the self-serve ice-cream machine. There's something magical about Mr Whippy ice-cream (as I like to call it). The simple, cold vanilla flavour never fails to please and it's a winning touch from Camile. We were stuffed leaving Camile. The portions are generous and the prices are attractive. There are now several restaurants serving this market, but Camile is up there with the best. They score extra brownie points for the range of dishes on offer which are coeliac friendly. Disclaimer: We received a complimentary Kevin Thornon meal and Po Pia Sot starter courtesy of Camile Thai and Presence PR. The #cameal promotion is available to all by following Camile Thai Rathmines on Twitter. Sorry to be a pedant. but it should be "complimentary". Depends if they were free, or if they simply went well with the main? Errr...the review says they were free.